Tomatoes and sundried tomatoes are gently fried with Extra virgin olive oil (2%) and garlic. 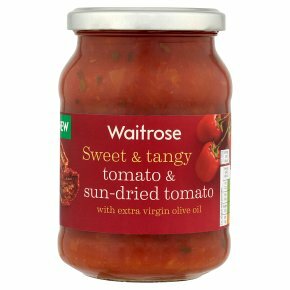 TOMATOES (76%) (diced tomato, tomato juice, tomato paste, firming agent calcium chloride), rehydrated sundried tomato puree (19%), extra virgin olive oil (2%), onions, basil, pureed garlic, salt, acidity regulator citric acid. Empty contents of jar into saucepan. Heat through gently, stirring occasionally. Do not allow to boil. Serve with pasta.